Where do you go when you have a hankering for good Chinese food? If you live in DC that’s a difficult question to answer. And when I hear your answer I can tell if you’ve ever traveled to China or at least whether or not you take your Chinese food seriously. Yes, I realize that that’s probably an unfair standard on which to judge someone but a girl’s gotta have some kind of yard stick, and that is just one of mine (and now you can start your judging of me). In Taiwan, I remember people discussing the best way to make fried rice with the same seriousness you would find people debating national healthcare at any gathering in DC. You would think that a culturally diverse city like DC would have some pretty good Chinese food options right? Well you would be wrong. A colorful Chinese archway does not a Chinatown make. I don’t think any sober soul is going down to 7th and H Street to find authentic Chinese food these days … and if you are we will never be friends! When I have a craving for authentic Chinese cooking I head up to Toronto, a city with some seriously tasty offerings. If I were to guess why this is the case I would say that Canada’s Asia-focused immigration policy results in a more dynamic and vibrant Chinese immigrant community. Many Chinese businessmen send their wives and children to Canada to acquire citizenship and attend universities. Because of this, the demand for authentic Chinese food is higher, and tolerance for Americanized Chinese food is pretty low. The result?—a better product. Simple economics applies to food as well. Within minutes of arriving at my family’s home just outside Toronto I’m trying to make a reservation at Kenny’s Noodle, a neighborhood spot where the food is delicious and the staff thinks waiting on my mini army of a family is delightful rather than daunting. Fried rice comes in a bamboo basket where fluffy steamed egg whites act as a pillow for beautifully cooked shrimp (notice the exclusion of soy sauce; if I see soy sauce in fried rice that’s an immediate negative strike). Pork belly with pickled vegetables in a clay pot was a recent discovery and immediate hit. Garlic eggplant is served on a sizzling hotplate and cut tableside – this means the light sauce has a deep caramelized flavor and the eggplant is actually able to assert itself properly because it isn’t drowning in some overly starched, sickeningly sweet, unidentifiable brown sauce. Fried whole chicken is savory and moist inside, crisp outside. No doubt the result of a good brine bath, and a visit to the steamer prior to the fryer. Ummm, I wonder how much flights are this weekend…. But as much as we all fantasize about jumping in a private jet and flying to other cities just to eat good food I’m going to wager it’s not very realistic. (And if it is a reality for you then Helloooooo… I think we should get to know each other. We should become, as hip people say, BFFs). But in my simple world I have to find local spots to dine at, and so I am grateful to the wonderful person who introduced me to Hong Kong Palace in Falls Church, Virginia. Ignore the name, the dishes are all Szechuan style rather than Cantonese. My first bite of their mapo doufu transported me back to Beijing where I was when I last tasted a really great version of this classic dish (a quick cheat sheet: doufu- Chinese, tofu- Japanese, bean curd– English). But even better is the fish and doufu with spicy sauce. 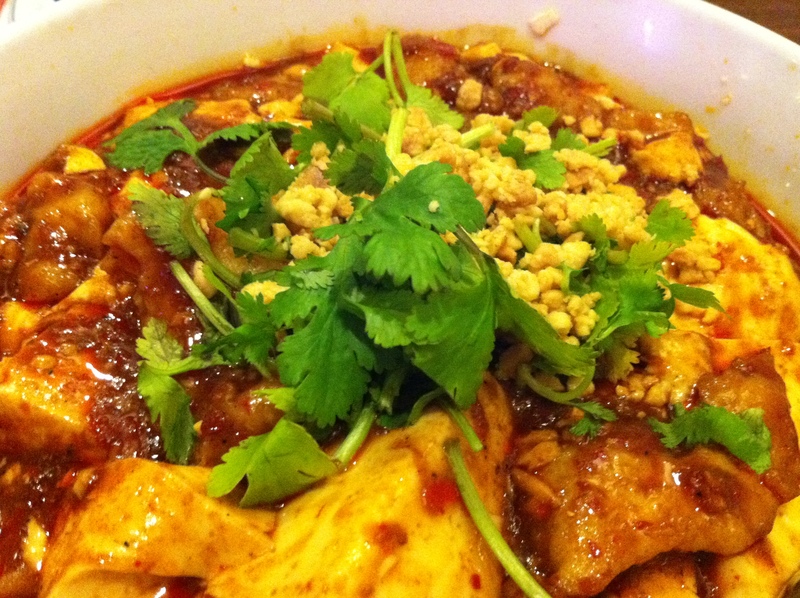 Soft doufu and lightly poached fish rest in a spicy chili sauce, topped with cilantro and crushed peanuts. The sauce is similar to mapo doufu in flavor, but because the doufu is stewed in much larger pieces it remains hot throughout the meal. Honestly, flavor-wise the fish could be removed and wouldn’t be missed but it does provide some textural contrast to the soft doufu. The best bet when ordering a vegetable dish is to ask what they have in season. Snow pea shoots or watercress sautéed with garlic are both delicious options. Celery with wood ear mushrooms is reportedly a popular dish but I found the use of western celery, which is larger and blander, rather than the Chinese variety made this dish a pass for me. Cold jellyfish salad, always a textural treat, is slippery and crunchy with a light sesame dressing and julienned cucumbers and carrots. Cumin lamb is fabulous. Dusted in flour, cumin and pepper then quickly fried and tossed with sweet onions and bell peppers. The lamb is surprisingly tender with a bold almost smoky flavor, a credit to the toasted cumin and accompanying spices. 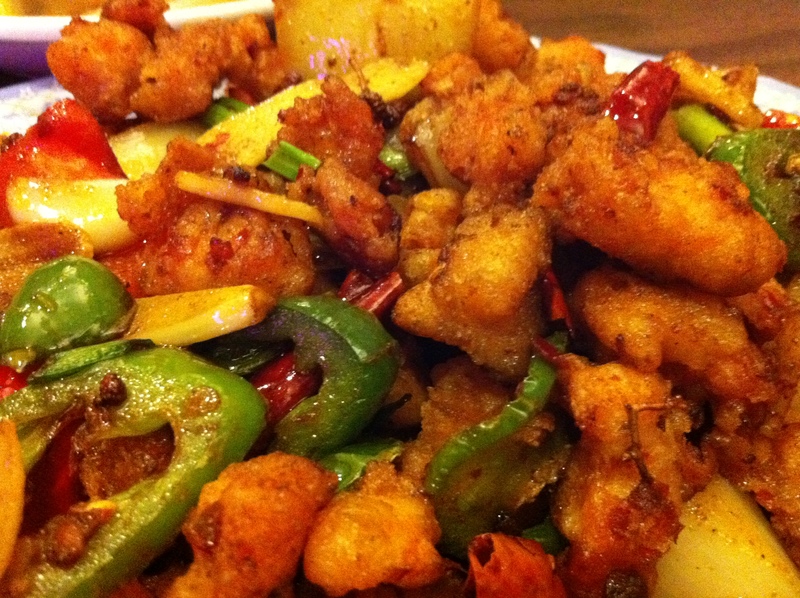 Fried chicken with dry chili peppers is prepared in much the same way (sans cumin) and loaded up with sweet peppers, dried chilies and Szechuan peppercorns. Ground pork with vermicelli is very similar to a dish I had several times at the Hunan style restaurant next to my hotel in Beijing last March. Vermicelli is tossed with ground pork, Chinese celery, ginger, scallions, chili oil and spices. Fennel seeds add a subtle anise flavor. So next time you’ve got a craving for Chinese food instead of ordering from your usual delivery place and then spending the next hour complaining about how DC doesn’t have any good Chinese food, jump in your car and head over to Seven Corners. Yes, I realize that I’m asking you city folk to cross the roaring Potomac river and brave the wild Virginian countryside, but trust me Hong Kong Palace is worth the visit. Amen! Nothing like Hong Kong Palace – just skip the American menu. I once asked them for something fresh – we got a whole fish in garlic sauce.